The service provides its users with the opportunity to create logo online for free in a convenient logo designer to purchase further high-quality source codes or download logos for free in png format. Logo maker supports Cyrillic, so it allows you to create a logo in Russian and other languages based on Cyrillic. Creating your own logo in real time is easy, creative and exciting, even for those who do not have a clue about photoshop, design, fonts and logos. How to make a logo with logo creator? In our review we use service, which called Turbologo. The layout of the logo is an appropriate image on the subject, optionally supplemented with brief text. 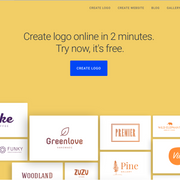 To create a new logo in the online logo maker, you need to write the text that you would like to see on the logo. In the column "Name:" you need to specify the name of the organization, if you create a corporate identity, if the same logo is created for the site, then you must specify the address or name of the site. In the example in the figure below, the site address is indicated, which will be the main text of the logo. As you can see in the picture, you can write capital letters in the logo, but there are some fonts that will not support them, in this case you just need to look for the font that will allow you to write in the logo with a capital letter. Clicking on the link “Add slogan” you can open the field for adding a slogan, slogan or any text that characterizes the direction of the business or website for which the logo is created. The words in the slogan should be well thought out, as they will characterize what lies behind the created logo. In the case of the example, one of the most successful slogans is indicated - “Designer of high-quality logos”. The form field “Choose activity” allows you to filter images by the necessary subjects, which is done for the convenience of image selection when creating a logo. So, the name with the slogan is invented, the type of activity is chosen, you can move on to the most exciting, but at the same time the most difficult process of creating a logo - to the selection of the layout. To do this, click on the "Next" button and go to the page for selecting layouts. As you already know, the designer has a huge number of layouts for creating a high-quality unique logo. To find the logo of interest, scroll through the pages with options for logo designs using the navigation: “Next” button and page number. Click on the “Next” button and proceed to the next stage of creating a professional logo for a business or website. Click on the button “Edit logo” and start editing the image, color, font of the logo. We will talk more about logo editing below. If there are priorities in colors, such as, for example, in the case of an already existing site, blog or social account, then immediately after opening the search results for logo mock-ups, you can click on the “Change settings” link in the lower right corner of the designer’s generator form above the “Next ". Immediately after this, a page will open with the option to select the preferred color schemes for the logo. After selecting, you must click the Apply button to continue searching for a layout for a logo in a specific color scheme, or click the Back to Logos button to return to the same search stage as before clicking on the “Change settings”. After you choose all points, you can view your logo.